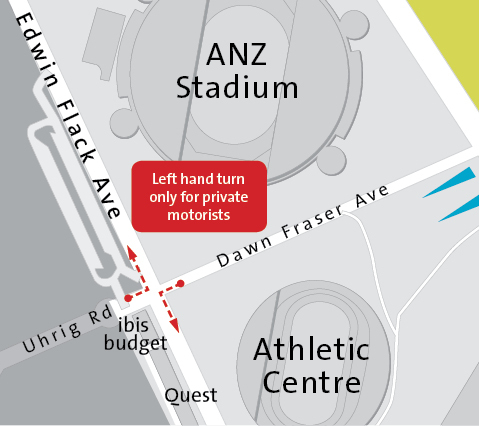 Sydney Olympic Park Authority is improving the safety of roads at Sydney Olympic Park by changing traffic conditions at the intersection of Uhrig Road, Edwin Flack and Dawn Fraser Avenues. This intersection was identified by Roads and Maritime Services as a black spot, and so private motorists will now only be able to make a left hand turn onto Edwin Flack Avenue. Buses are the only vehicles that will still be able to cross and turn right at this intersection. 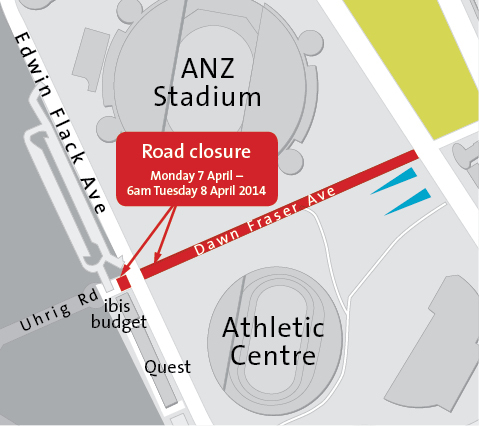 To allow for this change we will need to shut down part of Dawn Fraser Avenue and Uhrig Road from Monday 7 April until 6am the following day, Tuesday 8 April. The works will involve installing signage, creating a bus lane on Uhrig Road and Dawn Fraser Avenue and road marking. Traffic control personnel will be onsite during this time. Will include this in the April newsletter going out on Monday.